A MID TERRACED, MODERN, TWO BEDROOM TOWN HOUSE WITH PLEASANT REAR GARDEN, OFF ROAD PARKING AND WITHIN EASY WALKING DISTANCE OF THE TOWN CENTRE. Canopied Entrance, Hallway, Kitchen/Breakfast Room, Lounge/Diner, Main Bedroom with En Suite Shower, Bedroom Two, Bathroom, Enclosed Rear Garden, Off Road Parking for Two Vehicles, Gas Central Heating. 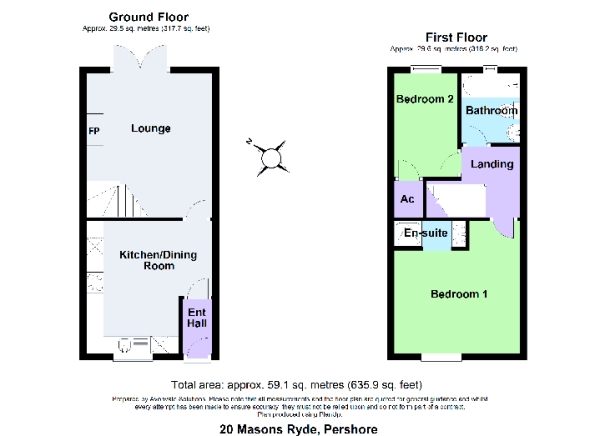 Number 20 Masons Ryde is a mid-terraced modern town house built circa 2000 and provides pleasant location within walking distance of the town centre. Masons Ryde is a popular residential part of Pershore, and this property offers off road parking and a neat cottage garden. All mains services are connected and there is no ongoing chain to this residence. Disclaimer - Property reference JMB1435. The information displayed about this property comprises a property advertisement. Rightmove.co.uk makes no warranty as to the accuracy or completeness of the advertisement or any linked or associated information, and Rightmove has no control over the content. This property advertisement does not constitute property particulars. The information is provided and maintained by Bomford And Coffey , Pershore. Please contact the selling agent or developer directly to obtain any information which may be available under the terms of The Energy Performance of Buildings (Certificates and Inspections) (England and Wales) Regulations 2007 or the Home Report if in relation to a residential property in Scotland.